Telecaster | Gear Acquisition Syndrome!! 67 years ago it started. In a flash of inspiration, it was considered. With months of innovation, it was designed. After months of perspiration, the unveiling took place! Well, actually, no. It wasn’t a snow shovel. It was the brand new guitar product that the Fender company had just launched called “the Telecaster”. But, unfortunately, there were loads of critics, disparaging of the new look and design, that CALLED it a snow shovel. And other epithets unmentionable in mixed company. That’s okay though, because the designers, not the critics, were on the right side of history in this scenario. Hard to believe, but 1951 was the very first year that a mass-produced, Spanish-style electric guitar with a solid body appeared on our planet. Wow. What in the world did players DO before then?!! Fender hit it outta the park on the Telecaster, although it took a couple years before all the detractors were hit were silenced and their ‘snow shovels’ put back in the woodshed where they belonged. All these players, and many more, found the bright, clean timbre of the Tele just the ticket for cutting through a live band mix, whether in concert and in the recording studio. Soon the obscure, new “boat paddle” was a regular part of the touring, working guitarist’s equipment entourage, indispensable and expected, rather than indefensible and neglected. What’s more, the simple, no-frills approach the guitar takes makes for few repairs needed over time, so word of its dependability and road-worthiness grew exponentially over time. The 60s, especially, saw an explosion of Telecaster interest, mostly due to incredible players who ALL played on Telecasters at one time or another… heroes like Jeff Beck, Jimmy Page, Eric Clapton, Paul McCartney, Syd Barrett, and yet another acclaimed Beatle – George Harrison (“Ticket To Ride”, anyone?!). Now, here we are, decades later, and the appeal of the Fender Telecaster has yet to be dimmed. For a complete look at all the varieties of Teles that Fender offers, check out THIS PAGE on their website. Disclaimer: I am not responsible for the drool that could short out your computer keyboard. Like many before me, I began looking for a Telecaster because of a song. UNlike many before me, the song was… my own. It’s a habit of mine to try to write songs in different ways, starting with different instruments. Without question, it keeps me from EVER, in my life, going through a dry spell. I’ve never had one. I just… keep… writing… ! 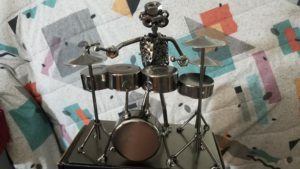 So I began to write a tune on the drums. I came up with what I considered a fun, shuffle rhythm, with a few differing sections, then laid it down in Pro Tools. Next, I thought it sounded like it was crying out for a cool, funky, clean rhythm guitar track. So… I donned my Paul Reed Smith (a Strat, mind you), set it to detente 2, midway between my neck and mid pickup, and began to create. Immediately, (riffing off of how the drums were inspiring me) I found myself playing palm-muted, chicken-picking funk riffs. Talk about fun! I improv’ed a bunch until I landed on a few choice phrases that seemed to form out the song. Laying it down in Pro Tools, I was pleased. BUT… it was missing something. I knew right away what it was. The combination of the drum beat and my newly-composed staccato, clean riffs was, to my ears, DEMANDING that it be a Telecaster playing, not a Strat. Yes, my friends, true and relentless G.A.S. had struck once again, and I was the eager victim. That balance between human need, dream and desire had once again been knocked all wobbly! I was teetering… on the brink… desperate. 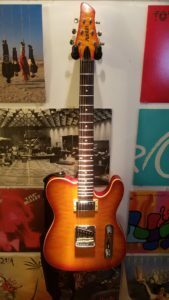 One thing was certain – I HAD to have a Tele! So, I started looking, and OOOoohh, man… the possibilities were limitless! I had no idea I’d find so many different Telecaster-type guitars to choose from. Imitation is the sincerest form of flattery, right? If so, the Telecaster has been complimented more times over than Allan Holdsworth used 4-note-per-string scales! I finally gave up searching when I reached the “Farmhouse” guitar (“Yee-haw.”), but there’s probably even MORE options that I just didn’t get to. Still not enough choices for ya? Well, then there are kits and/or parts manufacturers that set you up to BUILD YOUR OWN, having what’s called a “Partscaster”. Some kits and parts are licensed by Fender. Most are not. According to Fender (whom I just called and talked to “Chris”) the only truly LICENSED companies to manufacturer Telecaster clones are Warmoth and G&L. All the rest avoid litigation by making sure the Fender headstock shape & Fender decal/logo are not used. Are they all equal? Hardly. That’s why it’s important to get the requisite research on whatever piece of gear you’re gas-ing for. Here at Seriousgas we do that for you, really putting gear through its paces to find out how it really stacks up against the competition, complete with recordings we make in the studio. GO HERE for a good example. As they say, “the tape don’t lie”. Or, these days, the HARD DRIVE, rather! I’m putting together a Telecaster shoot-out in the studio for release soon, so stay tuned for those recordings. For the moment though, let me introduce you now to my own world of spanky tone… ! I was VERY fortunate to find (through Craigslist, actually) my Austin AU962 Tele guitar. 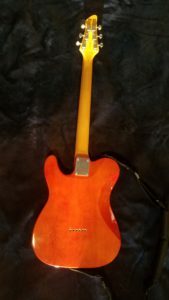 Once I knew I needed the Tele tone for that song, I went on the hunt, and almost got three or four other Teles of differing brands, but at the last minute (literally, in one case! ), someone else bought ’em. I saw an ad that had come out only 2 hours previous. The axe looked beautiful, and looking at the pickups and parts, I knew it wouldn’t be a bad choice. Immediately I called and within 2 hours, this gorgeous Austin was in my lick-ready hands! I had the pleasure of speaking with Rich Dumstorff who is the “Vice-President of SLM Marketplace” & the Product Manager for all things Austin. He filled me in a lot about my guitar’s history. He told me that Austin started out in ’94 or ’95 as a “catalog brand” for the St. Louis Music, a family-owned company, begun in 1922, for whom he still works. A catalog brand of instruments allows any mainstreet store (i.e. not a franchise) wanting introductory or intermediate guitars to buy as many, or as few, as they want. This is a great incentive for smaller stores, since most of the big companies want you to sign contracts which obligate you to buy A LOT of guitars from them each year. Catalog brands help “the little guys” compete with big box stores, by offering quality instruments at a competitive price point. This helps to keep these small music stores alive, year after year, here in the land of opportunity. Rich said my guitar is anywhere from 15 to 20 years old, and that it was made when Austin was trying to become a “player’s brand” and make a name with high-end players. Today, Austin has no such dreams of grandeur – they are unapologetically a beginners/hobbyists brand and probably will continue to serve their stores as such. This is great news for me, since my guitar was manufactured to higher standards to what’s currently offered. Back then, these instruments were made in Korea, and at that time the quality was on par with Japan’s export standard, which was quite high, and very much UNlike what was coming out of China. He further clarified that today Austin guitars are probably analogous in quality to what the Fender Squires offer, but that my older Austin is, and I quote, “… WAY better”. I like the sounds of that. And I’d have to agree. Oh, yea… Rich also helped me bust a myth I came across online that said Austin guitars were created by a couple guys who left Fender and used what they learned there to construct the Austins. Not true at all. The REAL story is that when the catalog brand of guitars at St. Louis Music, called “Series 10” guitars started to become somewhat “long in the tooth”, the company decided to up the quality and change the name. The Product Manager at St. Louis Music at the time had a son named Austin, and in true “daddy loves his boy” fashion, the new line was given his moniker. There was never any tie to Fender whatsoever. 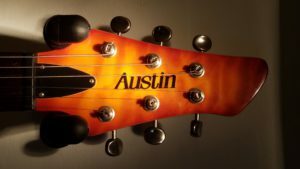 The current website for all Austin guitars in production can be found at www.austingtr.com. As an interesting side note, their parent company, St. Louis Music, also manufactures and distributes all Alverez instruments and supplies. The tone of my Austin rivals certain Telecaster models extremely well. 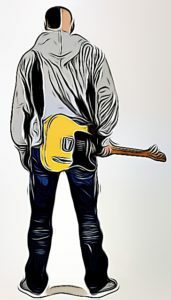 Obviously, the Fender Telecaster has not stayed the same through the decades; certain little changes came and went, and some different pickup combinations were offered here and there to appeal to players who wanted a Telecaster but with a bit of a different sound. Mine, for example, does not have the iconic single coil neck pickup that you see on stereotypical Telecasters. Instead, I have a mini-humbucker. I really like this for one simple reason: it’s quieter. Most of what I do is in the studio, so, when I’m recording, the last thing I need is a bunch of noise messing up my perfect take. This humbucker is a very warm, fat sounding pickup. It sounds to me almost “Gibson” in tone, but is modeled after the humbucking pickups Fender put on their Telecasters starting in 1968. Definitely more of a jazz or “singing lead” type tonality. Because I record a lot, I typically don’t want a guitar sound that “fills the room” so much, so this neck setting probably gets the least use. It IS, however, by far the quietest pup choice on this axe! 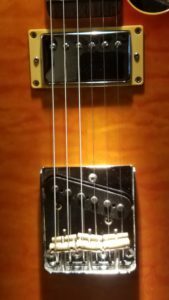 Now, if I combine both pickups with the selector, I have two choices: first, if I DON’T pop up the tapping knob, I get a bit of nasality in the tone that I don’t prefer usually. It’s pretty midrangey, which might actually work great for some mixes, but alone sounds a bit “meh”. Notice the Tone knob UP for my favorite tones! My second option though is sweet! If I pop the tapping knob up, I get this great, perfect rhythm sound that’s not the overly bright crisp tone that the Tele is known for, but rather a nicely balanced, not-too-full, but not-too-chirpy clean guitar tone that I can use for most anything. LOVE that setting! But what about the “classic twang” sound?? Isn’t that what the Telecaster is known for? Yup, and I get that too: I just slap the selector down to the bridge pickup, pop up the tone knob, which taps the pickup, and lordy, lordy… I’d swear I was in Bakersfield in Buck Owen’s band. Just the ticket for showing off those crispy, fast Nashville bluegrass licks. Or, as is my penchant, playing Joe Walsh’s “Funk #49” – it sounds amazing!! If I don’t pop up the tapping knob in bridge position, it has a similar tone but not as shrill. Much of the slap, chirp and pop is dialed down significantly, leaving just a brighter essential tone. Still good for soloing but for more the rock traditional kind of approach (“Stairway to Heaven”, I presume??). I’d probably not use the pick and middle-finger dual picking method on this setting. I’d say that’s a lot of versatility in one guitar, wouldn’t you? It’s not a one-trick pony by any means, which means it’s especially good for a live playing tool. There’s one thing I actually don’t like about my Austin though, and I’m probably going to remedy it soon: the tuners. Instead of a hole in the tuning peg, they just have a cleft cut in the peg on the top, so the string just sits in there and slips out waaaay too easily and often when I’m changing the strings. It’s poles apart from my favorite tuning peg design, which is on my Paul Reed Smith (check that beauty out HERE). But, as we know, guitars are all about tone, and I’m really, really pleased with this Austin. Considering that even the Standard Mexican Telecasters are three to four TIMES the price of this guitar, yet I still get that classic sound on my recordings… how can I not wear a cowboy pickin’ and grinnin’?! Oh, and finally I have to mention a cool feature on this axe that is a departure from normal Tele practices: Austin chose (in a blink of genius!) to put the selector switch between the Volume and Tone knobs. Why is this cool? 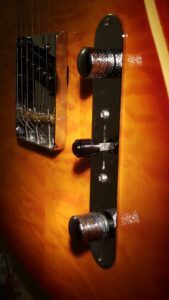 Because some Fender Telecaster players have mentioned that occasionally they’ll hit the selector by accident while playing, because it’s above the knobs and right where your downward stroke will hit it. Austin solved this issue in their design, and I’m a fan. It’s Gonna Be a Bright, Bright, Sunshiny Tone! Got your own case of G.A.S. for this legend of a guitar?? There’s plenty of variations to choose from, as I mentioned above, but if you want THE one and only, unadulterated, iconic, American-made classic, go FIND IT HERE! Since getting a Tele, I’m seeing all kinds of new ways of playing that I’ve never considered before, all inspired by this outstanding instrument. Funny, isn’t it, how getting a new axe can really widen not only your tonal prospects, but your technical mastery as well?! Maybe you already own a Tele? Or maybe you’ve owned many? Whatever the case, let us know how it’s worked for you, and share your road stories of this all-time favorite of guitars. We’ll be waiting to hear your tall tale, to help us all when we get that Telecaster G.A.S. tease cracklin’ in our bellies! That’s all for this post. So join me: pick up a Tele, and go… make… sounds! !